Bottle kicking and pie scrambling in Leicestershire! Stuck for something to do this Easter weekend? Do you live near or are visiting Leicestershire? 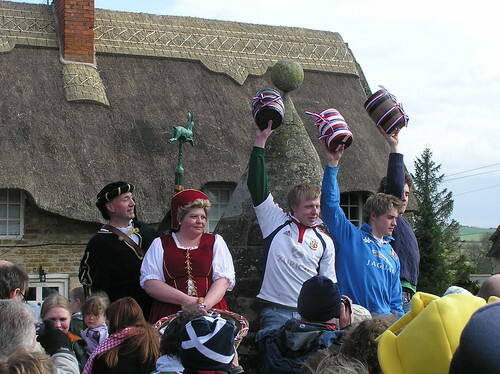 Well, Easter Monday’s contest of bottle kicking and hare pie scambling between the villages of Hallaton and Medbourne. This age old tradition is believed to have started in the 1700’s and starts with both ‘teams’ parading through each village where a hare pie (actually made of beef nowadays) is thrown into the crowd and there’s an almighty scramble to claim it. Once this is done both teams wrestle a ‘bottle’ (small keg) over a rather challenging terrain of streams, barbed wire, ditches and hedges and this is done as best of three competition to ascertain the winner! Tough going and can get rather competitive and can last several hours. Perhaps you might not want to join in if you’re not up for the rough and tumble aspect, but watching it go on will be a rather entertaining spectacle! The festivities will begin at 11am in the sports field on Hallaton Road, Medbourne. Refreshments will be available and there is free parking for spectators, so if you’re near by it sounds like it’ll be a great family day out. This entry was posted on March 31, 2010, 9:30 am and is filed under Events, Fun, Holiday advice, Last minute breaks. You can follow any responses to this entry through RSS 2.0. You can leave a response, or trackback from your own site.